Summary (from the inside flap): The United States is at war, and sixteen-year old Ned Begay wants to join the cause--especially when he hears that Navajos are being specifically recruited by the Marine Corps. So he claims he's old enough to enlist, breezes his way through boot camp, and suddenly find himself involved in a a top-secret task, one that's exclusively performed by Navajos. He has become a code talker. Their experiences in the Pacific--from Guadalcanal to Iwo Jima and beyond--will forever change him.... Navajos braved some of the heaviest fighting of the war, and with their code, they saved countless American lives. Yet their story remained classified for more than twenty years. When the war ended they weren't able to tell anyone--not even their families--about their true contribution. Review: At first I wasn't sure about this book, but I gradually got pulled into the narration of the main character and the story of the Navajo Code Talkers of World War II. 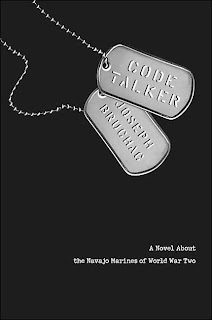 I had heard about the code talkers and knew the basics, but reading it in novel form was so enlightening and interesting. The most interesting part was how the Navajo soldiers convinced the white officers and other soldiers of their commitment to the US through their actions, knowing that words wouldn't do it. As with many minorities groups, life in the service was in some ways easier than life back home in the US where the general population was much more racist and unforgiving. 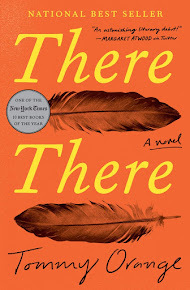 Have you read this book or others about Native Americans and their contributions? I haven't read this book, but it's on my wishlist. I love books about military and I love reading about WWII. I have to pick this up someday! Thank's for the review! I loved this book. I learned so much about WWII and the Navajos and could not help but fall in love with the main character. Several of my (male) students have read this book and liked it. Thanks for your review! I have always been fascinated with this little known facet of World War II history, and Joseph Bruchac is a great Native American writer. Stephanie--I had never read any Joseph Bruchac before. I'll have to see what else he's written!